Martha and I loved last weeks hop. We saw so many wonderful posts with gorgeous tea cups in them! Yay! We loved visiting each and everyone of you. 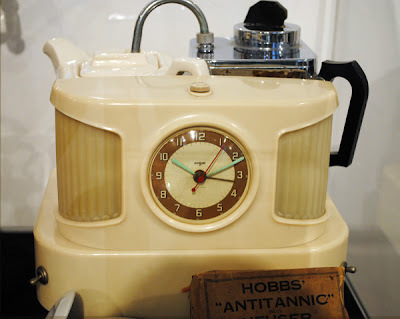 This week I am sharing about the Winchester Discovery Center's exhibit called "Tea Tales" and it showcases Britain's history with it's favorite hot drink...TEA! It is a small center, but they packed in a wonderful display about tea. I was lucky to get to visit this show with my dear friend Cheryl. It was certainly interesting! 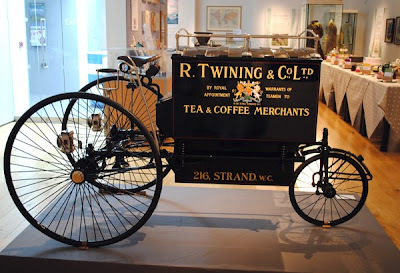 Wouldn't that be something to see a vehicle like this one taking tea orders to it's customers? 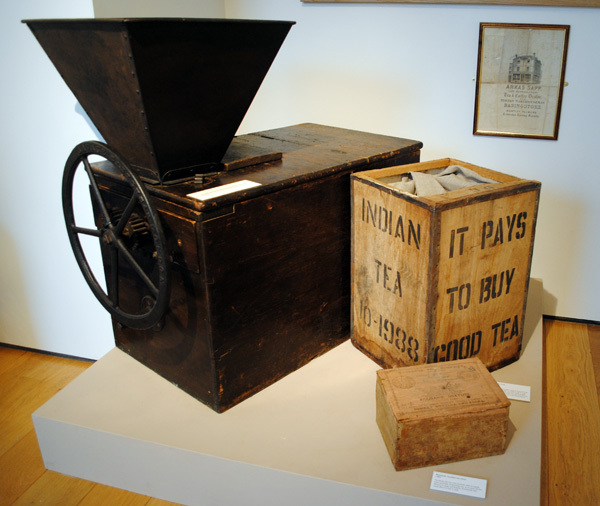 A tea grinder, a tea storage crate and another tea chest, that might have held tea's mixed by the shopkeeper. The merchant would order tea in bulk, then grind it and mix his own blends to offer to his customers. Books were rare in the early days of tea. Women created their own receipt (as it would have been called back then) or recipe books. 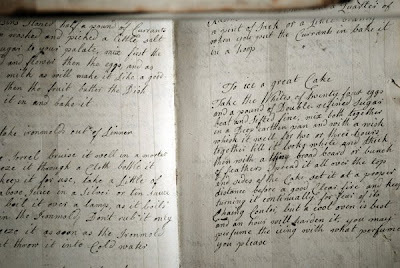 There is a recipe for tea balls in the book, but this page tells how to Ice a Great Cake. This book is not dated, although notes in the back cover are dated 1759. I feel quite sure that if I had lived during this time, I would have created my own books too! Maybe even with drawings and watercolors? Definitely! 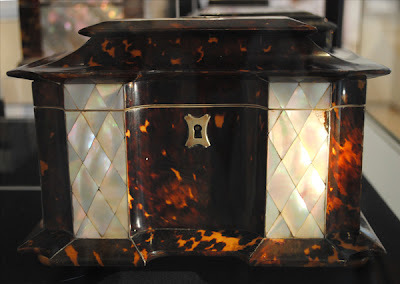 This is a gorgeous tea caddy with tortoise shell and mother of pearl. Another beautiful elaborately decorated tea chest. This one isn't so pretty is it??? It is an electric automatic tea maker. I think it was from the 50's. 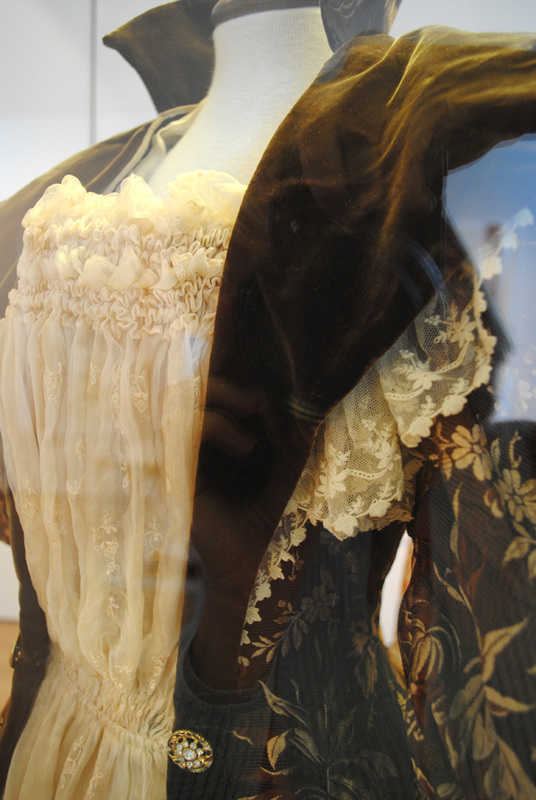 Here is a gorgeous tea dress! I find the details so very romantic looking! I was sure I took a photo of the information, but alas, I can not find it. So I will have to guess that this dress was worn in the 1800s. Anyone have an idea? I wish I had taken more photos! But I hope you enjoyed this little trip to Winchester! The show is on until September 10th, so if you live nearby it is still open. The same day I went to the Tea show, it was market day. I found this beautiful trio at a stall there. It seemed the perfect finish to the day! It is my first Royal Crown Derby! Thank you all so much for your very fun comments to my previous post about meeting my favorite British actor over the summer! I was so surprised how many of you know and love Martin Clunes too and his character Doc Martin! Thank you all for stopping by to visit me today. I will be out and about all day visiting your tea cup posts! Please create a post with the tea cup you want to share with us, tell us about it, how did you get it, who is the manufacturer....show us the backstamp (oooooh....aaaahhhhhhhh). Martha and I love backstamps! We love seeing companies we don't know or own any of their china. But most of all, have a beautiful and creative week. I love the tea chest! And the delivery cart is so cute!! Your trip to England certainly was interesting. I love both the tea caddies and the delivery vehicle was so cute. Nice teacup too. Thanks for sharing. The teacozy at the top is beautiful...so much hand work, it is art! The teacup trio you got is very pretty! 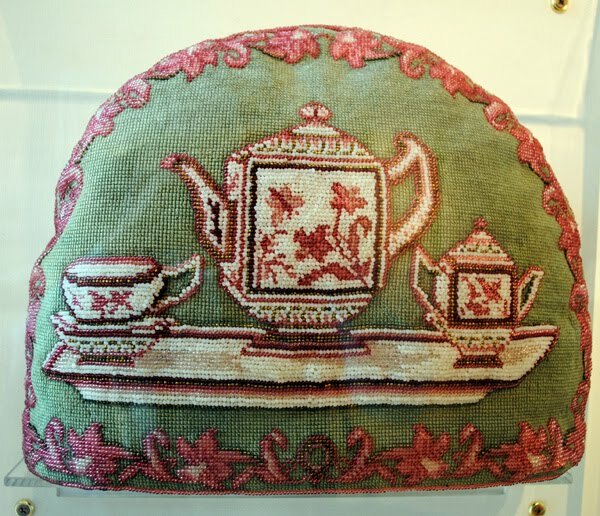 What an amazing tea cosy. Love the Tea Wagon! And, the cozy and caddies are lovely! But, that tea gown - more a style of the late 1800's - perhaps even into the Edwardian time of the early 1900's. Would love to wear it! Thanks for hosting and continuing to share your England photos with us. I am eating up each and every image and anecdote! that was a gorgeous trip. Thank you for showing all those wonderful fotos. The diffrent items are all so interesting. Isn't it funny that it seems as if this gone time was so much better than ours? Your teacup is a pretty one, too. Thank you so much for sharing and for hosting this sweet event. What a neat post on tea Terri! thanks for taking us there. And, Thanks for hosting the party! Thanks for sharing your trip to Winchester!!! So much to see!! !I will have to share the link to your blog post in my next post!!! Drop by for tea today, if you get a chance. estou aqui viajando nas suas maravilhosas fotos! 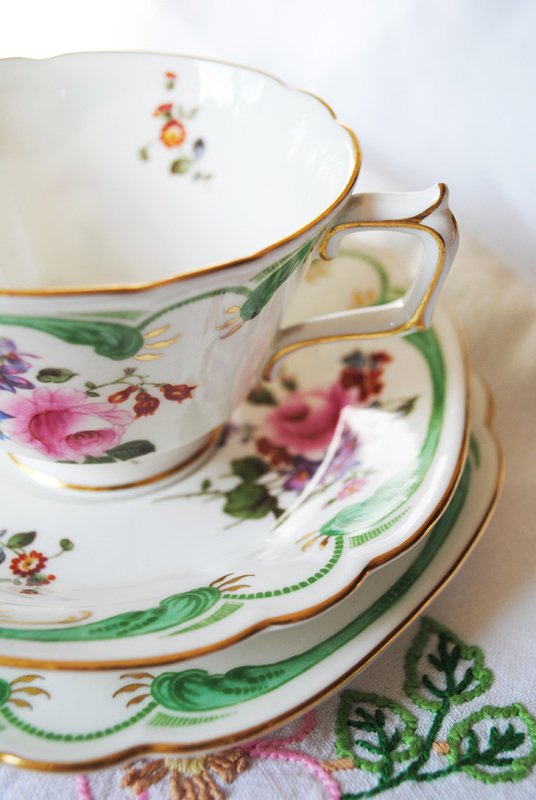 Your new tea trio from Royal Crown Derby is gorgeous. I love the tea cozy you started your post with. Wonderful tea caddies and delivery cart is fun! Great, interesting exhibition. Happy Tea Day! 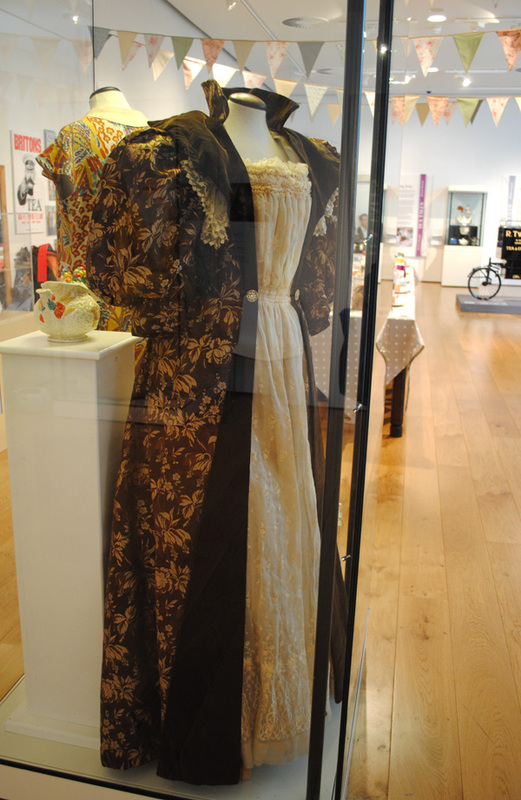 Terri, I love the cosy, the tea caddy and the tea dress. What a fun place to visit! Your tea cup is a real stunner as well. What a wonderful exhibit! Wish I'd been able to see it. The automatic tea maker is called a Teasmade (or Teasmaid on some versions) and was popular especially in the 1960-1970s. Charles * Diana received 3 as wedding gifts! Hello today. I'm enjoying visiting all the participants. That is a very pretty tea cup you found at the market. The perfect place for you to visit!! I love the cosy, so beautiful, and the caddi is fantastic.Well what now to say about the gown :both fantastic and beautiful- oh they dressed amazingly, back then. Wow..Beautiful post Terri!Such fabulous photos..so wonderful to see..thankyou for sharing all of these gems!! Fantastic! oh what fun!!!! looks like everyone is having an amazing tea party this week!!! It was great to see all those displays at the Tea Tales exhibit. Those tea caddies really are gorgeous. Thanks for all the nice photos and information. Your Royal Crown Derby trio is beautiful. A great post and lovely tea cosy and lots of great pictures. I have a friend who studied in Winchester and some great memories of visits there, including a lovely tea shop. And the tea trio is beautiful. Such gorgeous coloring. More beautiful photos from England! 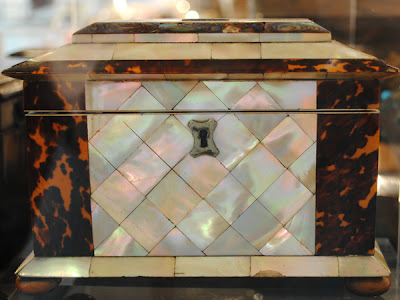 I have always been fascinated with tea caddies. Thanks for sharing ...your posts have been just great. 3 hours as of late, but I nеver dіscovered any interеѕting artiсle like yοuгs. It's lovely worth enough for me. In my opinion, if all site owners and bloggers made good content material as you probably did, the web will probably be a lot more useful than ever before.